Math always came easily to me but as soon as I left high school, I turned on the subject completely. I was going to college to experience life, to write stories, to study humanities. I avoided math because I knew I’d never do anything with it other than use it to calculate tips and make sure I wasn’t being cheated out of the money I did not have. And by the time I entered college (probably by the time I entered high school or even junior high), I already knew enough to take care of any money business I imagined I’d come across in my life. So math fell away from my life. Except it didn’t. It is embedded in so many things I do. I love jigsaw puzzles. That’s math. When I doodle, which is often, I create patterns. That’s math. When I cook, lots of math is involved. Planning my day or my week or a vacation means thinking about time and time management requires an understanding of math. As does art. And writing. Math is in the planning. Math is even in the execution. One thing they don’t teach you in school but is key to learning is that the subject breakdown into Math and Science and History and English is artificial. It allows for us to go deeper into the building blocks of life experience, but it ignores the fact that in practice, we call on all of the subjects jointly, in various combinations. Hence, art and writing being math. But also being science and history and English. Harry Baker, a quirky young mathematician, stood on stage at TEDxExeter in February 2014 and introduced his presentation with a short, humorous poem. Then he went on to perform an original poem about math, which was really about falling in love. He followed that with a poem that led to his winning the Poetry World Cup in Paris. That poem, titled, “Paper People,” like the other poems he performed on stage, used the language of math to talk about the things that matter from politics to bullying to love. In all, he performed three spoken word poems in less than 14 minutes and charmed and delighted his audience, including me. At the end of each TED talk, there are recommendations for other talks on similar subjects, and since I loved Harry Baker’s talk and I am very suggestible, I decided to listen to Adam Spencer talk about his love for monster prime numbers. Spencer is a comedian and radio personality in Australia and a self-defined geek. At one point in his talk, he explains that after getting his PhD in Math, he realized that in a room full of non-mathematicians, he could be considered brilliant but in a room full of Math PhDs, he was dumb as a box of hammers. He says, “My skill is not in the mathematics. It is in telling the story of the mathematics.” And it is. The way he talks about the hunt for the largest monster prime number is completely accessible for those of us who haven’t studied math since high school. And the way he brought it around to being about the essence of being human was flawless. Enough math for today, I thought. I need some art, some anthropology, some good ole humanities. And then I saw the description for the mathematician Ron Eglash’s TED talk. From the start, I was drawn in because Eglash explained what a fractal was through the use of a diagram that reminded me of a story plotting system I once came across and found extremely helpful. The system was called the Snowflake and at the time, I saw it as a more intuitive, visual representation of an outline for a research paper. You have your main idea, break it down into supporting ideas which break down into ideas that support those supporting ideas, and so on. Now that I know what a fractal is, I realize that the Snowflake system uses fractals to grow a complex story from a single seed. Unfortunately, I started to drift off after listening to Eglash speak, not because he wasn’t interesting but because he was trying to get across a complex concept in a short period of time, and I couldn’t absorb it aurally. I wanted to stop him and ask questions because while I understood his general premise, the details started to get confusing which made the premise more confusing. I did make my way through the whole speech and feel like I learned something but I’m not sure I can articulate what the main takeaway from the speech was. In Spencer and Baker’s speeches, I felt as though I had a handle on what they were saying throughout but here, I felt overwhelmed. Others, who think differently than me, might not need the extra explanations, so I think they would get a lot more out of the talk than I did. The main thing I took away from Robert Lang’s talk is that because of mathematic formulas, origami has advanced to an art form similar to sculpture. 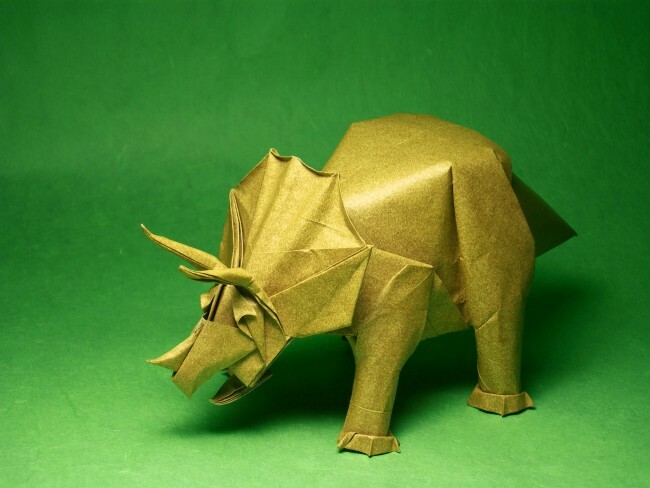 He showed several examples of sculptural origami pieces each made from one un-cut square that has been folded in an intricate pattern (see the triceratops sculpture photo at the beginning of this post – all made from one un-cut 40×40 square.) He got into detail about the four rules of origami and the role of math in the advancement of this art form. I felt like he went too fast. I could have gained more from fewer examples drawn out, but overall he was entertaining as well as informative. And despite his talk not being my favorite of the four, it is probably the only one that drove me to do some research. I’ve only made origami birds a few times, but the idea of being able to use pre-designed papers and to learn to fold them into these sculptural masterpieces really excited me. If you only have time to watch one of the talks, I’d suggest the Harry Baker one. He is brilliant and charming and his poetry is both accessible and exciting. Have you ever heard somebody call poetry exciting before? The other three are all good too, but if I had to pick a second one to watch, I’d say go with the Adam Spencer one. He knew how to share information in an extremely entertaining way. Not sure I’d want to do the math class thing again. Are you almost finished with your program? I’m a junior, so I have a ways to go still. I’m getting pretty close to finishing the math requirements for my degree, assuming I don’t pick up a minor in Mathematics, which is a distinct possibility. He was quite the charming geek. And put on a good show.